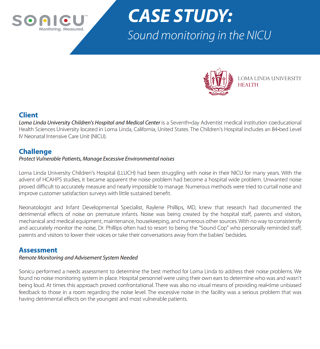 Find out how Loma Linda University Children's Hospital and Medical Center noticed immediate improvement in NICU sound levels after installing Sonicu wireless monitoring for hospital noise reduction. Accurately identify, assess and manage your hospital noise with Sonicu. Reducing hospital noise is simple. Complete the form below to learn more.